The data on improvement of technology of modification of VGI in the conditions of production of PJSC «KAMAZ», a stabilizing proportion of vermicular graphite forms at the level of 60...80%. Key words: Iron, modification, vermicular graphite. The results of the use of integrated microcrystalline modifiers containing calcium, barium and strontium for steel 20G2SL 20GFL and to improve the mechanical characteristics of the cast. Key words: Complex modifiers, barium, strontium, toughness, pollution of non-metallic inclusions. The process of restoration of the geometry of the turbine blade stylus TS (turbostarter) manufactured by casting of heat-resistant alloy ЖС6-К of aviation turboprop engine НК- 12МП is analyzed. A comparative analysis of two types of recovery of stylus’s geometry has been carried out: the reduction by soldering with powder solder ВПр24 in ceramic forms and laser powder cladding ВПр24 in a powder bath. The structure of reconstructed layers by means of electron microscopy with elemental analysis of transverse microsections has been explored. It is recommended to use pulsed laser powder cladding (build-up welding) for this purpose. Key words: Laser cladding (build-up welding), self-fluxing solder, powder bath, regenerative repair, electron microscopy, elemental analysis, micro hardness, soldering. Discussed are issues of developing core sands that are hardened by a fundamentally new scheme – as a result of interaction of orthophosphoric acid HPO with a number of alumocontaining materials (ACM), and contain no ready binders or scarce hardeners/ Also presented are results of making a binder at interaction of HPO with aluminum nitrate. Key words: Aluminosilicate, aluminum nitrate, aluminum phosphate, binder, core mixture, phosphoric acid, sludge, X-ray analysis. The analysis of references showed that recommendations about the choice of values of elements of multistage feed systems are practically absent, and those which are need specification. By means of computing model operation ratios of the areas of elements of the multistage feed systems providing serial filling with a melt of a cavity of a foundry core are established. Key words: Multistage feed system, melt flow, fiber filling, hybrid technologies. Center of attention of the article is Cold box amin technology for core molds and cores production, its share in world production, detailed description of process and main advantages from experience of the implemented projects of Laempe. 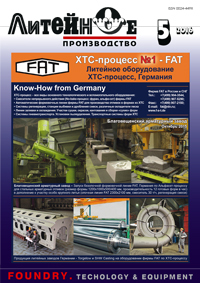 Key words: Modernization of foundry production, innovation, modern core and mold making solutions, Cold box amin-process. Examples of castings for various purposes with the use of additive technologies in the manufacturing stage models are presented. Key words: Restoration work, the casting of artistic and decorative purposes, small-lot production of prototype castings, investment casting. The process of construction of the piston sproduced by casting in a metalmoldis examined. The recommendations on the choice of the provisions in the form of castings and structural performance gating – feeding systems using computer technologys haringintegrated design of the internal combustion engine pistons are presented. Key words: Casting technology, computer-integrated design, gating system, the internal combustion engine, the piston.